Being perhaps the second most advanced city in Indonesia for emerging modern culinary concepts, Bandung, as I said before in my Daisy’s Steak & Grill post, is a melting pot of ‘culinization‘. The latest trend in Jakarta and Bandung besides the fro-yo fever, which has now gradually subsided, would be the everlasting pancake madness. Most likely started from Pancious in Jakarta, Bandung recently also owns Nanny’s Pavillon which I have posted also before. 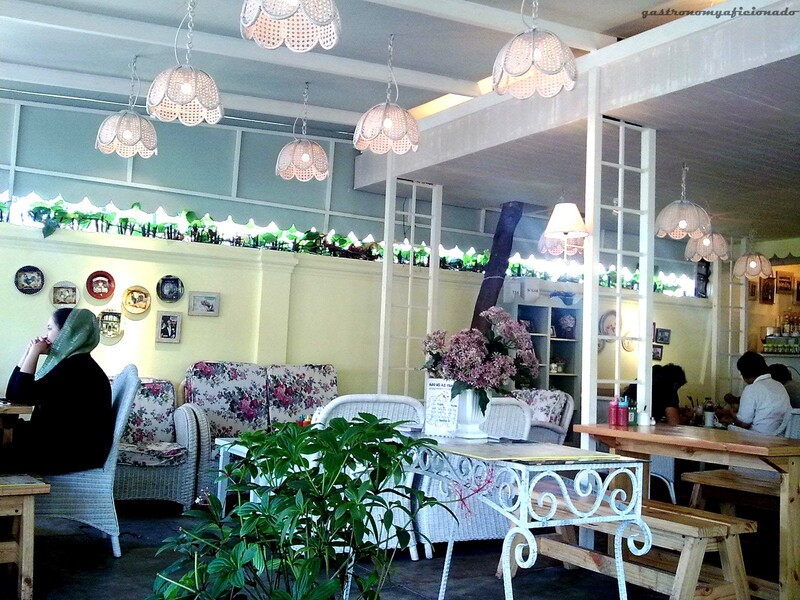 Bandung now also introduces her ‘Nanny Wannabe’ (credit for a friend of mine) diners. Either they’re aligned with Pancious/Nanny’s Pavillon or not, the thing is Western style diner is now officially ravaging my country. That morning, I was picking up my girlfriend at the train station and we were looking for a good place for breakfast. I had been thinking about several good local places but instead, I was suddenly remembered that we got this new diner in Progo St. and since it’s in my nature to try something new, therefore I decided to make a visit. Giggle Box is the name, looks strikingly similar with Nanny’s Pavillon but somehow we felt more comfort, with a relaxing music and less crowd, also not to mention the Bandung chilly breeze upon a nice neighborhood like Progo St., it was indeed a pleasant morning for us. Not to worry about the capacity. Despite the looks, Giggle Box also has seats on the second floor. You might be worry because in weekends especially at dinner time, this once silent and empty road will be full of cars. Mostly to Kopi Progo, but several competitors such as Toko Coklat, The Strudels, and this Giggle Box also join in and everybody seem to have their shares in one of those establishments. Also, Giggle Box boasts itself with good variety of food and especially drinks in one single tier of cheap price. This price tier suitable for citizen of Bandung usually still around IDR 5,000 to IDR 10,000 for hawkers, but with a nice place and the commodities Giggle Box has to offer, they’re indeed still generous with the pricing. Ranging from around of IDR 10,000 to IDR 30,000 you can get almost everything you want from Western style food. Beverages? Even more considerate and you can pick from hot coffee, iced coffee, blended coffee, blended drinks with Rhum, soda based homamade drinks, Frappe, jelly drinks, juices, smoothies and so on. Since the Western theme that seems to dominate the place, it would be a good idea to order any Western dishes that seem to be abundant here. From the starters to the mains, pasta, or there’s always choices for you who want local delicacies as well. 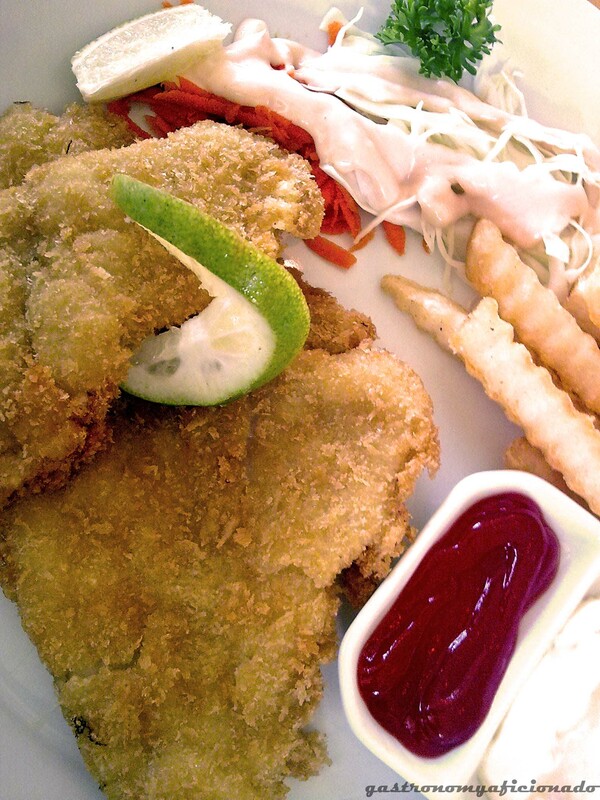 Beef Schnitzel (IDR 19,000) and Fish & Chips (IDR 25,000) were our picks for the breakfast. Drinks? 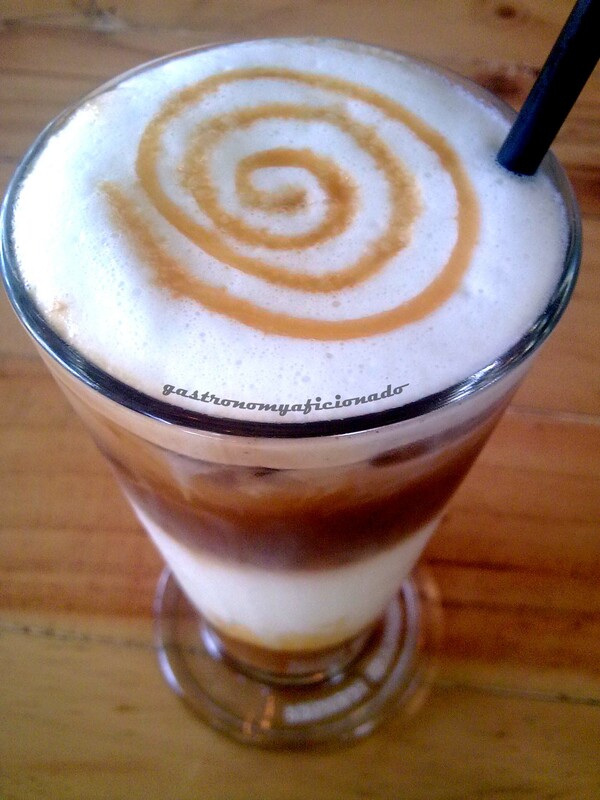 Hot Caramel Latte (IDR 14,000) and Strawberry Smoothie (IDR 14,000) were the choices for the morning. As the dishes came in, they did not really arise my interest. The size of the schnitzel and the fish may be adequate, which was good, but from those who accompanied them, that’s the real problem came. First of all, the supermarket French fries! No matter you say how good it is, but still, it’s only a frozen potatoes ready to be fried! I was even unsure about the freshness, the quality, and most likely fried without salt or any strengthening condiments. Next would be the vegetables. It’s like Hoka Hoka Bento julienned carrots and cabbages added with mayo. It’s not special really and it works well if with HHB so-called Japanese dishes but not here. For the fish and chips maybe but for the schnitzel? Not a chance! They can actually use sauteed vegetables like in steakhouses. It’s easy and more decent. I guess with a pricing like this, even that shouldn’t be a problem. So how are the fish and the schnitzel? In terms of size, very adequate especially the fish. Quite intimidating for a city like Bandung though if you compare it directly with Fish & Co., well.. it’s gonna be a joke. First of all, it was thin but luckily, the fish still in there. The schnitzel was okay too though my girlfriend said that the fish was better. At any rate, it’s still worth the try. Not a very satisfying breakfast for me but it was for my girlfriend. The drinks were okay. The smoothie was made also out of yogurt so it tasted sour and fresh. Topped with ice cream to make it even better. I liked it and it was only for a bargain! The coffee was not bad either. The caramel can cover the weaknesses and it’s a prudent choice I know, however, it was a good ending from the so so dish. Nevertheless, it was a cozy place. You have to experience the cool morning of Bandung there. Or is it possibly that you want to lounge a bit on the sofa or even spend a warm atmospheric dinner with your close friends and the teen society of Bandung? Elders and kids are also encouraged to be shared with this joyous time for families. From breakfast to brunch, or for lunch and dinner, or even for just a cup of coffee and Frappe, Giggle Box has the answer for it. Quite satisfactorily though, not up to my standard I’m a afraid. Recommended Dishes: Won’t recommend anything for now. Appetizers from IDR 9,000 to IDR 15,000. Main dishes from IDR 12,000 to IDR 40, 000. 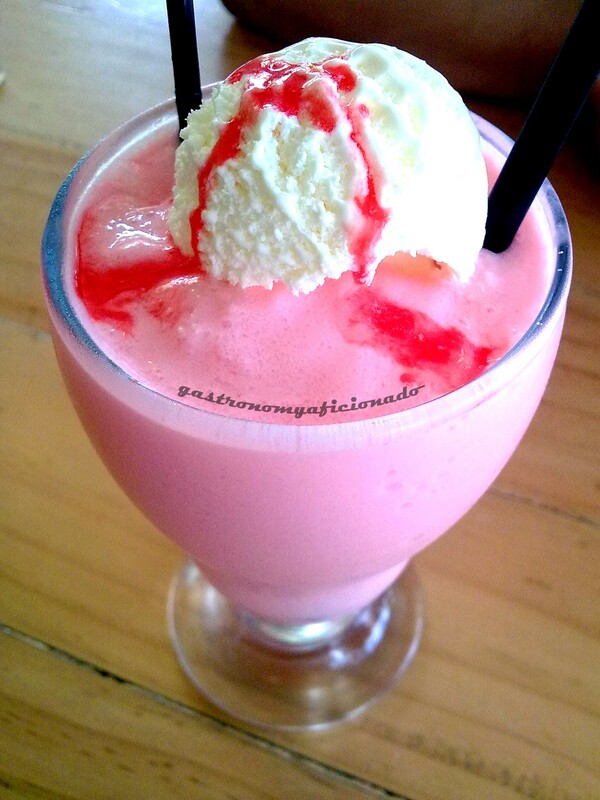 Beverages starting from IDR 7,000 to IDR 20,000. For two people the total was IDR 84,000. Not too satisfied with the food but judging from the variety in food and beverages and still within the considerate price, it’s worth the try. Not that impressive. But if you combine it with Bandung’s fresh breeze, the relaxed neighborhood, the semi open air concept although with benches and few sofas, nevertheless they do offer a nice place for afternoon coffee or breakfast. Not much to say about it. At least they’re quite helpful and knew what they’re doing. Unimpressed with the food but perhaps you can challenge more from the drinks. The Strawberry Smoothie was good, the coffee was not bad, and you can explore more with the rest. As for the food, I wouldn’t recommend much but for commoners, surely they’ll be contented. Previous PostRestaurant Review: KitchenetteNext PostTGA Milestone: It’s The 10K Hit!